Ukiyo-e Japanese woodblock prints were mass-produced in the Edo Period and early impressions of a given print are generally of higher quality and more sought after by connoisseurs than late impressions. The present publication presents an innovative approach that combines the classical method of examining line quality with a systematic study of colourants. This approach was used to compare an impression of Hokusai’s iconic ‘Red Fuji’ with its rare variant, ‘Pink Fuji’. Woodblock wear and printing effects were studied using high resolution photographs and the colourants were characterised using non-destructive methods. 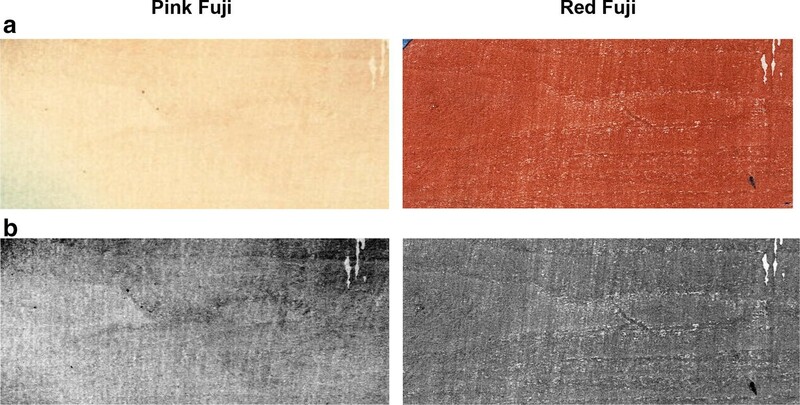 Signs of greater woodblock wear were identified in ‘Red Fuji’ compared to ‘Pink Fuji’ and there were indications that much more thought had been given to the selection and application of the colourants in ‘Pink Fuji’. This showed that ‘Pink Fuji’ was printed before ‘Red Fuji’ and is possibly a first edition. The approach developed here represents a novel way of studying Japanese woodblock prints and can be used to determine the sequence of impressions of other prints. The production of Japanese woodblock prints in the 19th century was traditionally supervised by publishers who appointed artists, woodblock carvers and printers. The role of the artists in this mass production was to design the print. They were also involved in the choice of the colourants and printing effects for the first edition of a print , typically the first 200 impressions . The publisher then often departed from their intentions and altered the colour palette or simplified the printing effects for commercial reasons. The number of impressions made from a given set of woodblocks was not recorded but it has been estimated that a publisher had to sell at least 2000 impressions from a design to make a profit . For instance, some of the designs by Kunisada (1786–1865) are estimated to have been printed between 3000 and 4000 times . Very popular prints could be issued in even greater numbers: ‘Fifty-three stations of the Tōkaidō’ by Hiroshige (1797–1858) is thought to have been printed between 12,000 and 15,000 times . Woodblocks used to make prints gradually became worn away with use. Identifying the impressions, in which an artist chose the colourants and directed how these were applied, is important in terms of better understanding the artist’s vision. How early an impression is also significantly affects its value, as early impressions are considerably more valuable than late ones. This article presents an innovative approach that was developed to compare two impressions of the iconic print ‘Clear day with a southern breeze’, commonly known as ‘Red Fuji’, by Hokusai (1760–1849). The first impression pictures Mount Fuji as a red mountain (Fig. 1a) and belongs to the British Museum (London). It is by far the most common design of this print, while the second impression is a very rare variant with more muted colours, sometimes referred to as ‘Pink Fuji’. The impression examined here is in the collection of the Musée National des Arts Asiatiques Guimet (Paris) and a photograph of it can be found in  (for copyright issues it cannot be shown here). For illustration purposes, a photograph of another, very similar, ‘Pink Fuji’ impression is shown in Fig. 1b. The ‘Red Fuji’ print is part of the series ‘Thirty-six views of Mount Fuji’, which depicts Mount Fuji from different locations and includes Hokusai’s famous ‘The Great Wave’. This series was produced in the early 1830s when Hokusai was in his seventies and at the height of his career. It was so successful that ten additional designs were commissioned. Ukiyo-e scholar Roger Keyes has spent much of his career studying Hokusai’s artworks, including ‘Red Fuji’ and its variant ‘Pink Fuji’ . He believes ‘Pink Fuji’ to be amongst the earliest impressions of the design and its colour palette to be the original palette selected by Hokusai, but this theory has not been investigated scientifically to date. As Japanese woodblock prints are notoriously sensitive to light damage (see for instance ), the possibility that some light fugitive colourants were used on ‘Pink Fuji’, which could have now faded, cannot be discounted. In order to study woodblock wear, it is necessary to understand how woodblock prints were produced and a short summary is given here. The woodblock cutter made the first woodblock for the production of a print, called the ‘keyblock’, by pasting the artist’s final ‘block-ready’ brush drawing face down onto a cherry woodblock and carving either side of the artist’s lines with a chisel. This left a network of raised ridges corresponding to the outlines of the print. The printer then used the keyblock to produce a number of black and white prints, from which further woodblocks were made for the final print, typically one block for each colour. To produce an impression, the first woodblock was inked and a sheet of paper made from mulberry fibres was laid on it and rubbed against it using a small pad. Then the sheet of paper would be laid on the second woodblock and so forth. For a detailed account of the printing process of Japanese woodblock prints, see [7–9]. Although woodblocks were made from seasoned fine-grained cherry wood, they were subject to wear with repeated use. In the present study, the ‘Red Fuji’ impression from the British Museum and the ‘Pink Fuji’ impression from the collection of the Musée National des Arts Asiatiques Guimet were examined. They were first photographed at very high resolution and the images produced were then used to examine each impression for signs of woodblock wear, such as loss of sharpness and breaks in the lines. Using digital images and printouts reduced handling of the impressions and minimised the risk of damage to them. Then, the colourants were characterised. Multispectral imaging (MSI) is useful to map the spatial distribution of colourants in artworks [10–13] and was initially used here to determine which areas had been printed using the same colourant. This technique involved examining each impression using selected ranges of wavelengths in the electromagnetic spectrum that include and extend beyond the capabilities of the human eye. Colourants used in Japanese prints can be very difficult to identify as they are often present in extremely low concentrations. For instance, conventional Raman spectroscopy, frequently used for the identification of pigments in paintings , is often unsuitable for the study of Japanese prints as the paper substrate tends to be fluorescent and mask the Raman signal from the colourants. Organic colourants may also be fluorescent and cannot be identified using Raman spectroscopy. 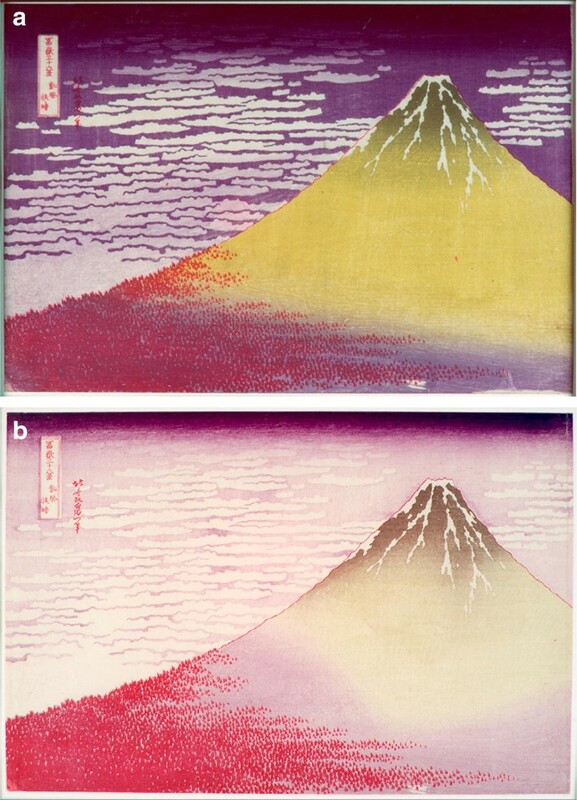 Surface enhanced Raman scattering has been shown to be successful for the analysis of colourants on Japanese prints [15, 16], but requires micro-samples, which many museums do not allow. Only non-destructive techniques were used in this work, i.e. X-ray fluorescence (XRF), MSI and fibre optic reflectance spectroscopy (FORS). XRF was used to determine the elemental composition of each colourant, which is useful for the identification of inorganic pigments, while MSI and FORS are well suited to the characterisation of organic dyes [17–21]. Research has shown the combination of these three techniques to be a good protocol to identify most colourants on artworks . Other non-destructive techniques have been employed to analyse colourants on ukiyo-e prints, such as spectrofluorimetry , excitation–emission matrix fluorescence spectroscopy  and Fourier transform–near-infrared fibre optic reflectance spectroscopy , but they are less established and usually not readily available to museums. Finally, printing effects were studied on both impressions by examining the tonal contrast and the application of colourants. The focus of this work was to develop a systematic approach to compare two impressions of Hokusai’s print ‘Red Fuji’ and determine the order in which they had been produced. This approach represents a novel way of studying Japanese woodblock prints and can be used to determine the sequence of impressions of other prints. The multispectral images of both impressions were obtained in the visible, infrared (IR) and ultraviolet (UV) spectral regions using modified commercial cameras fitted with band pass filters. For the ‘Pink Fuji’ impression, a Nikon D7000 camera was used [maximum resolution of 4928 × 3264 (16.2 megapixels)], while the ‘Red Fuji’ impression was imaged with a Canon 40D camera [maximum resolution of 3888 × 2592 (10.1 megapixels)]. For visible-reflected imaging, the impressions were illuminated by two photographic Classic Elinchrom 500 Xenon flashlights, each equipped with a diffuser and symmetrically positioned at approximately 45° with respect to the focal axis of the camera and at about the same height. An interference UV-IR blocking IDAS-UIBAR filter (bandpass, c.380–700 nm) was placed in front of the camera lens. For infrared-reflected imaging, the impressions were illuminated as above and a Schott RG830 cut-on filter (50% transmittance at c.830 nm) was placed in front of the camera lens in order to block off the visible component and investigate the range between 800 and 1000 nm. For ultraviolet-induced visible luminescence imaging, the excitation was provided by two Wood’s radiation sources (365 nm) filtered with a Schott DUG11 interference bandpass filter (280–400 nm) and symmetrically positioned at approximately 45° with respect to the focal axis of the camera. The emission of these radiation sources is a relatively sharp line centred at 365 nm. A Schott KV418 cut-on filter (50% transmission at c.418 nm) and an IDAS-UIBAR bandpass filter (c.380–700 nm) were placed in front of the camera lens, in order to investigate the visible range . For ultraviolet-reflected (UVR) imaging, the impressions were illuminated as above and a Schott DUG11 interference bandpass filter (280–400 nm) was placed in front of the camera lens so as to block off the visible and infrared components. All images were acquired as raw images with a maximum resolution as indicated for each camera and transformed into the equivalent resolution images in 16-bit tagged image file format, by applying a set of recommended presets which turn-off all enhancements (e.g. recovery, fill light, blacks, contrast, brightness, clarity, saturation, as well as setting the tone-curve to linear). This procedure can be carried out using the camera software or external programs such as Adobe Photoshop. For further details on the conversion of raw images, see the manual on multispectral imaging techniques . Post-processing procedures for the standardisation and calibration of the images, as well as the creation of infrared-reflected false-colour (IRRFC) and UVR false colour images, were then carried out using “BM_workspace”, a plug-in for Nip2, the open-source graphical user-interface of VIPS, a free image processing software . This image correction procedure requires that an X-rite (or “Macbeth”) Colorchecker® and a reference grey scale, comprising a set of Lambertian black, grey and white tiles, are placed close to and in the same plane as the object under investigation. These Spectralon® references have uniform reflectance properties across the ultraviolet, visible and infrared spectral ranges under investigation and show no luminescence properties . For details on how to download BM_workspace and the Nip2 software, as well as descriptions, workflows and data requirements for the post-processing of these images, see . Both impressions were analysed using an Artax XRF spectrometer operating at 50 kV and 500 µA with a collimated beam of 0.65 mm and a counting time of 200 s. The impressions were suspended between two support stands and the beam focussed on each of the different coloured regions. Both impressions were attached to a supporting mount board, which could not be removed for the analysis. The measurements for each colourant therefore include elements present in both the paper substrate and mount board. The contribution of the paper and board was measured in the areas corresponding to the snow on Mount Fuji (as these contained no colourants) and subtracted. Fibre optic reflectance spectra were recorded with an Avantes AvaSpec-ULS2048XL-USB2 spectrophotometer equipped with an AvaLight-HAL-S-IND tungsten halogen light source. The detector and light source were connected with a fibre optic bundle to an FCR-7UV200-2-1.5 × 100 probe. In this configuration, light was sent and retrieved by the bundle set at approximately 45° from the surface normal, thus excluding specular reflectance. The spectral range of the detector was 200–1160 nm; nevertheless, due to poor blank correction on both the extremes of the range, only the range between 400 and 900 nm was considered. As per the features of the monochromator (slit width of 50 μm and UA type grating with 300 lines/mm) and the charge coupled device detector (2048 pixel array), according to the manufacturer, the best spectra resolution was 2.4 nm calculated as full width at half maximum, based on averages of actual measured data (with 200 µm fibers) during quality control, with 10–20% standard deviation. Spectra were referenced against the area of the paper left white, i.e. with no ink applied, and corresponding to the snow on Mount Fuji on each impression. The diameter of the investigated area on the sample was approximately 2 mm, obtained by setting the distance between probe and sample at approximately 5 mm. The integration time was 100 ms and each spectrum was the average of five acquisitions. The whole system was managed by the software AvaSoft 7 for Windows™. Examining and comparing high resolutions photographs of the ‘Red Fuji’ and ‘Pink Fuji’ impressions showed that the outlines and coloured areas were remarkably similar on both impressions, which confirmed that these were made from the same set of woodblocks. For instance, the patterns of the clouds and the trees were identical and a small area with no ink in the green base of the mountain, most likely caused by imperfections in the corresponding woodblock, was present on both impressions (Fig. 2). There was very little sign of woodblock wear on either impression, indicating that they were among early impressions. Keyes  reported that a break in the inner border on the right of the character ‘jū’ 十 is present on ‘Red Fuji’ impressions in the title cartouche, but not on ‘Pink Fuji’ impressions. As illustrated in Fig. 3a, this was observed in the case of the two impressions under investigation. 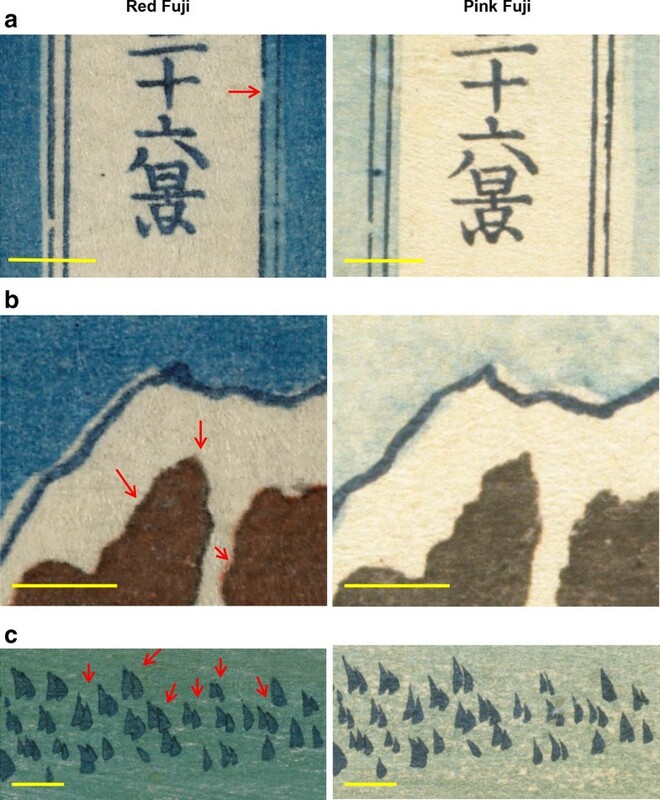 Further examination revealed other signs of greater woodblock wear in ‘Red Fuji’ compared to ‘Pink Fuji’: for instance, the shape of the areas covered with snow were sharper and more detailed in ‘Pink Fuji’ than in ‘Red Fuji’ (Fig. 3b), and there was a loss of definition for some of the small trees at the bottom of the impression in ‘Red Fuji’ (Fig. 3c). Furthermore, as can be seen in Fig. 1, a woodgrain pattern is visible in the body of Mount Fuji. This intentional use of a woodblock’s woodgrain pattern is called ‘mokume-zuri’ (which translates as ‘wood-eye printing’). Printers used this effect in areas where the woodgrain pattern would resemble, for instance, ripples in water or raked lines in sand beds, or they used it simply to achieve an interesting graphic effect. Keyes reported that ‘two “eyes” in [the] horizontal wood-grain pattern [were] separated’ in ‘Pink Fuji’, while they [became] “connected” in later impressions’ . As illustrated in Fig. 4, this was seen with this set of impressions too: features have widened up in ‘Red Fuji’ compared to ‘Pink Fuji’. This is most likely because a thin layer of wood became abraded through the repeated use of the woodblock, which exposed a new surface of wood. All these observations indicate that ‘Pink Fuji’ was printed before ‘Red Fuji’. Japanese printmakers in the 1830s used a limited range of colourants (see Table 1) as not all materials they had access to were suitable for the woodblock printing process. This is because colourant particles need to be fine enough to penetrate the paper when they are applied on the woodblock, but not so fine that they run through the paper . The use of six distinct coloured inks could be distinguished on the ‘Pink Fuji’ and ‘Red Fuji’ impressions and, as listed in Table 2, it was possible to determine on which areas each had been applied using MSI. The deep blue colourant in the sky at the top of the print and the light blue colourant in the sky contained iron, as shown by the XRF analysis. This is indicative of Prussian blue and the corresponding FORS spectrum (Fig. 5) matched published spectra of Prussian blue . Prussian blue is an artificial blue pigment made of ferric ferrocyanide. The use of Prussian blue in the series ‘Thirty-six views of Mount Fuji’ by Hokusai is well documented . No elements were detected in significant quantity on the areas printed in dark blue (i.e. the outline of Mount Fuji, the signature, the cartouche title and the trees) using XRF, which suggests the use of an organic colourant. As illustrated in Fig. 6, these areas appeared bright red in the IRRFC images of both impressions, which indicates that they were printed using indigo (the red appearance of indigo in IRRFC images has been described in [35, 36]). This was confirmed by the FORS spectrum obtained from the outline (Fig. 5), which had an asymmetric absorption band at c. 660 nm consistent with published reference spectra for indigo [17, 33, 37]. In addition, the round concave slope of the spectrum in the 700 to 900 nm range indicates that a small amount of Prussian blue had been mixed to indigo. The use of mixtures of indigo and Prussian blue on ukiyo-e prints has been reported by other researchers, e.g. [33, 38]. The green colourant used for the lower part of Mount Fuji was found to contain iron, arsenic and sulphur. This suggests that it is a mixture of Prussian blue pigment and a yellow arsenic sulfide pigment. The yellow pigment is most likely natural orpiment, rather than synthetic arsenic sulfide as recent research  indicates that synthetic arsenic sulfide was not used until the very late Edo period (1850s–1860s), while ‘Red Fuji’ and ‘Pink Fuji’ were printed in the early 1830s. 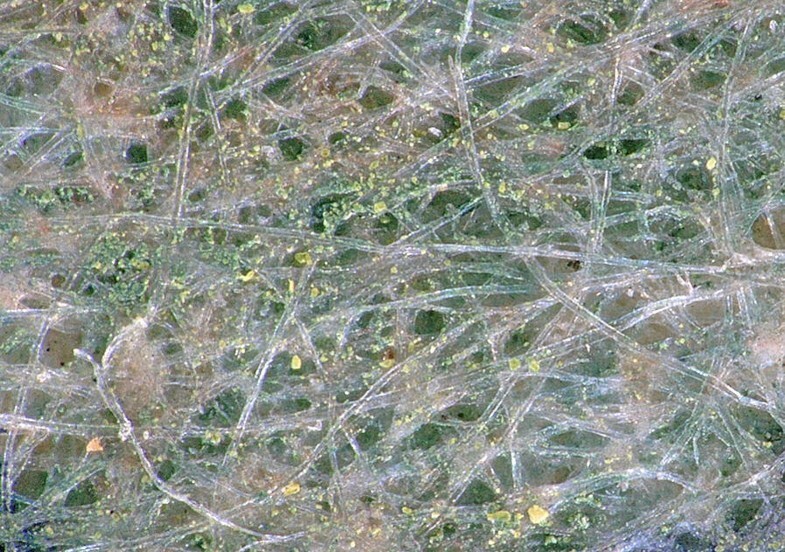 Indeed, when examined using a microscope, small yellow particles of heterogeneous size could be observed in the green areas (Fig. 7), which is typical of natural orpiment. Particles of synthetic arsenic sulfide pigments are much smaller in size and more homogeneous [40, 41]. Orpiment is transparent to infrared radiation and this was observed in the IRRFC images, where the green area appeared the same hue as the areas coloured in Prussian blue in the sky (Fig. 6). 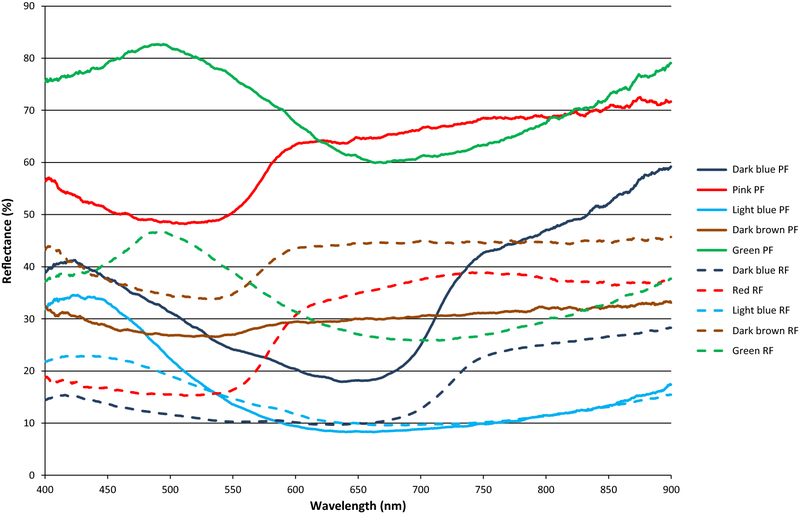 Finally, the FORS spectrum of the green colourant with a maximum reflectance at 490 nm and a broad minimum reflectance at 670 nm (Fig. 5) was very similar to spectra obtained for mixtures of Prussian blue and a yellow pigment . It should be noted that the FORS spectrum of orpiment has very few features, making the identification of orpiment difficult using this technique. High levels of iron were measured on the body and top of Mount Fuji on both impressions, indicating the use of earth pigments, which vary in colour from yellow, orange, red to brown and contain iron oxides. This was supported by the results of the MSI and FORS investigations. As illustrated in Fig. 6, the body of Mount Fuji and its top appeared yellow and brown in the IRRFC images respectively (with a slight green hue in ‘Red Fuji’). These colours in the IRRFC images are associated with iron oxides . The FORS spectra (Fig. 5) displayed a sigmoid shape with an absorption band between 400 and 500 nm and a sharp positive slope between 550 and 600 nm, which is typical of earth pigments , and the inflection point at 570 nm is indicative of hematite . The absence of manganese in the XRF results suggests that raw or burnt umber were not used . A small amount of arsenic was detected at the top of and on the body of Mount Fuji in ‘Pink Fuji’, which indicates the additional use of orpiment. As orpiment is transparent to infrared radiation, it was not visible on the IRRFC image of ‘Pink Fuji’. Orpiment was not be detected in the corresponding FORS spectra (Fig. 5), but Alfed et al. also reported that the reflectance spectrum of a mixture of yellow ochre and orpiment was very similar to the spectrum of pure yellow ochre. No notable UV-induced visible luminescence was observed on either of the impressions, suggesting the absence of organic dyes such as safflower. The combined findings of these investigations are summarised in Table 3. The same colourants were detected on both impressions, the only difference being that orpiment had been added to the earth pigment used for the pink and brown parts of the mountain in ‘Pink Fuji’. Of all the colourants identified on the two impressions, only orpiment is light fugitive as it converts to colourless arsenic oxide upon exposure to light (see  for instance). However, in these two impressions, orpiment did not appear faded: the green area at the bottom of Mount Fuji, printed using a mixture of Prussian blue and orpiment, appears green, and not blue, as it would appear if the orpiment had faded. It cannot be entirely discounted that small amounts of yellow or red organic colourants are present on ‘Red Fuji’ or ‘Pink Fuji’ but could not be detected using the techniques used. Finally, it is interesting to note that orpiment had been added to the earth pigment for the body of Mount Fuji in ‘Pink Fuji’, and not in ‘Red Fuji’. Orpiment was much more expensive than the other yellow colourants available at the time, but its colour is much brighter and clearer. The greater use of orpiment in ‘Pink Fuji’ indicates that more resources had been given to the production of ‘Pink Fuji’ compared to ‘Red Fuji’. The results of these investigations suggest that the muted colour palette of ‘Pink Fuji’ is intentional and could be the one originally intended by Hokusai, as stated by Keyes . Photographs of the ‘Pink Fuji’ and ‘Red Fuji’ impressions were converted to greyscale images using Adobe Photoshop software (Fig. 8). This highlighted that there is much more tonal contrast in ‘Pink Fuji’ than in ‘Red Fuji’. The high tonal contrast in ‘Pink Fuji’ suggests a more skilful choice of colourants. Also, the colourants seem to have been applied in a more subtle way in ‘Pink Fuji’, especially at the top of Mount Fuji by the snow and along its slope. In the sky, in particular, a blue dappling effect in ‘Pink Fuji’, which is absent in ‘Red Fuji’, contrasts with the pattern of the clouds and creates graphic interest. In ‘Pink Fuji’, the green and brown colours in the body of Mount Fuji gradually meet in a concave arc, while in ‘Red Fuji’, they meet in an almost straight line (Fig. 1). The techniques used to produce this effect were discussed with an experienced woodblock printer in Japan, David Bull. According to him, in order to create this transition, the two colours of Mount Fuji were printed one after the other using the same woodblock and achieving a gradual transition between the two colours is technically very difficult. Blending the two colours along a concave arc, such as in ‘Pink Fuji’, is even more difficult than blending them along a straight line, such as in ‘Red Fuji’ and is not well-suited to mass production. Surviving correspondence between Hokusai and his publisher demonstrates Hokusai’s demanding obsession regarding the production quality of his designs  and the use of this highly skilled printing technique is consistent with ‘Pink Fuji’ being a first edition impression. 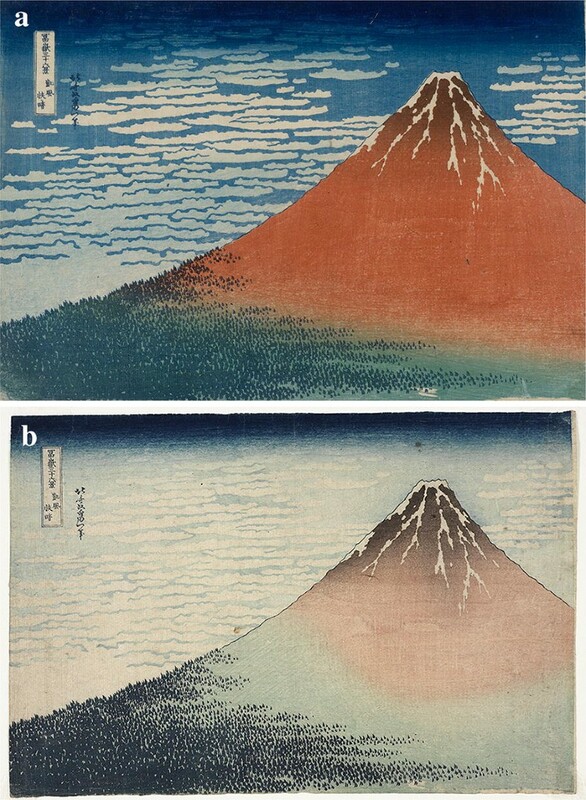 A methodology was developed to compare an impression of Hokusai’s iconic ‘Red Fuji’ with its variant ‘Pink Fuji’ and determine which one had been printed first. High resolution photographs of both impressions were taken and carefully examined. These showed that there was little woodblock wear on the two impressions, indicating these were both early impressions. However, there were signs of greater woodblock wear in ‘Red Fuji’ compared to ‘Pink Fuji’, such as a small break in the cartouche, loss of sharpness in some features and widening of the woodgrain pattern from the woodblock in the body of Mount Fuji. The combination of MSI, FORS and XRF analyses allowed the characterisation of the colourants used in the production of ‘Pink Fuji’ and ‘Red Fuji’. It was found that the same colourants had been used in both impressions, the only difference being that orpiment—an expensive pigment at the time- had been added to the earth pigment used for the brown parts of Mount Fuji in ‘Pink Fuji’. There were also strong indications that more thought had been given to the production of ‘Pink Fuji’ than to ‘Red Fuji’, in terms of the application of the colourants, tonal contrast and printing techniques. These findings showed that ‘Pink Fuji’ was printed before ‘Red Fuji’ and suggests that ‘Pink Fuji’ is a first edition impression. There was no sign of colour fading, which supports Keyes’s claim that the muted colour palette in ‘Pink Fuji’ was intentional. The methodology developed in the present study represents a novel way of studying Japanese woodblock prints and could be used to determine the sequence of impressions of other prints. CK wrote the main manuscript text and all authors reviewed it. CK, LP-P and PM designed research and analysed data. LP-P conducted the XRF and FORS analysis on ‘Pink Fuji’. PM and CK conducted the XRF spectroscopy tests and MSI on ‘Red Fuji’. JD and LP-P carried out the MSI on ‘Pink Fuji’. All authors read and approved the final manuscript. We are grateful to Tim Clark, head of the Japanese section at the British Museum, for his support toward this project and the staff at Musee Guimet for giving us access to ‘Pink Fuji’. Thanks are also due to our colleagues in Scientific Research at the British Museum: Aude Mongiatti and Duncan Hook for their help in conducting the XRF analysis. Finally, we thank Prof Carl Heron, director of Scientific Research, for his support and, in particular, helpful suggestions on this manuscript. All data is available from the corresponding author on reasonable request. Dr. Lucia Pereira-Pardo is an Andrew W. Mellon Postdoctoral Research Fellow and would like to thank the Mellon Foundation for its financial support. Dyer J, Verri G, Cupitt J. Multispectral imaging in reflectance and photo-induced luminescence modes: a user manual. 2013. https://www.britishmuseum.org/pdf/charisma-multispectral-imaging-manual-2013.pdf. Accessed 21 Sept 2018.
http://www.labsphere.com/site/assets/files/2628/pb-13058rev00_sdr_standards.pdf. Accessed 21 Dec 2018. Edwards G, Karnes C. Characterization and identification of colorants in a Japanese pillar print. In: Library of Congress Conservation Highlights. Library of Congress. 2012. http://www.loc.gov/preservation/conservators/japanesecolorants/index.html. Accessed 15 Apr 2017.